A virtual wall of protection. An invisible layer of defense. While threats span the globe, Benchmark Surveillance Technology has customers covered. We develop custom surveillance solutions and platforms for unique threat detection applications in mobile and rugged terrain environments, as well as urban smart city applications. Whether you need a fleet of mobile surveillance vehicles and ground sensors to span a national border, intelligent connected cameras integrated into infrastructure, or cutting-edge security to safeguard assets and events, Benchmark Surveillance Technology can customize a revolutionary, cost-efficient solution. Offering a virtual wall of protection, our Integrated Surveillance Solution (ISS) puts cutting-edge surveillance, tracking and acquisition at a user’s fingertips, simplifying complex situational awareness challenges. With 24-hour mobile, remote and portable surveillance across land or sea, ISS unites imaging, unattended ground sensors, drone, radar, laser ranging, remote video, GPS and MIMO radio technologies for the most comprehensive, customizable system available. Learn more about the specifications of the components of ISS. Smart Cites are here, offering huge potential to completely change the way we live for the better. Benchmark integrates our Internet of Things (IoT), surveillance and analytics capabilities to customize smart city solutions to meet our customers' exact needs. Our platforms typically consist of hardware or sensors, connectivity or data transport, and visualization capability. Benchmark Surveillance Technology’s leading team of systems integration engineers enables surveillance technology to be smarter, not harder, blending seamlessly into people’s lives. 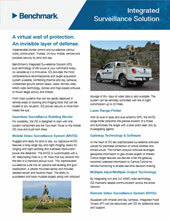 Learn more about the virtual wall of protection.